It must have been quite a place in the early days of captain E.T. Barnette, gold miner Felix Pedro en judge James Wickersham. 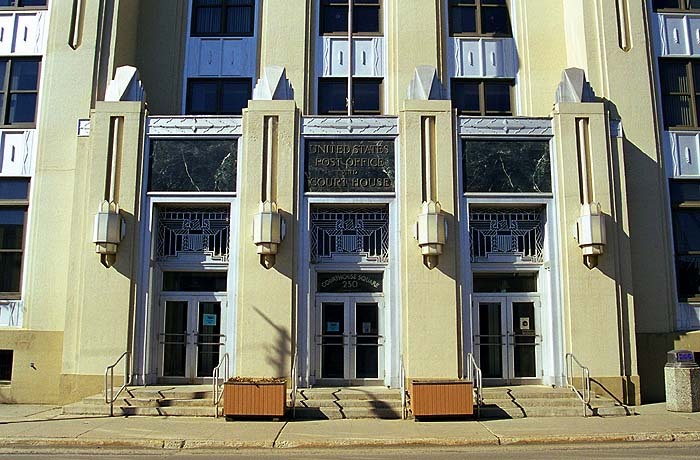 Not many historic buildings remain today in downtown Fairbanks. Fires and floods have left their traces, and obviously for many years the preservation of history was not on the city's mind. That may have changed now but all that is left from the early days are a few pioneer log cabins and the old Immaculate Conception Church. Plaques and markers, some in very odd places, tell stories of what used to be. Most of the modern downtown buildings were not build for their good looks and the general layout is rather haphazard. 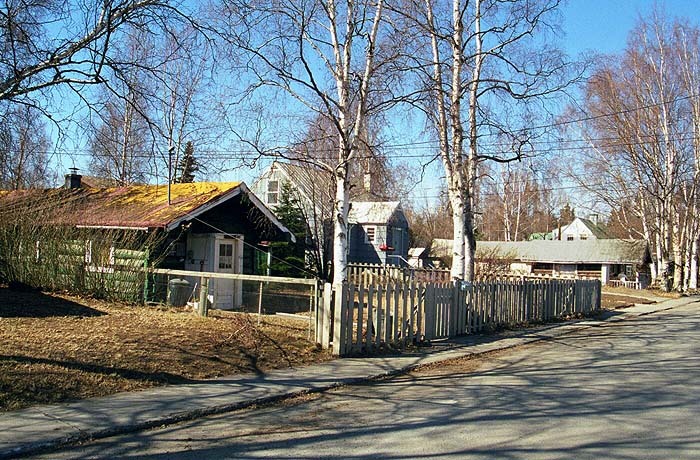 Third Avenue: some of Fairbanks' original log homes still in use today. A building of character: the old US Post Office and Court House on Cushman Street, with cast aluminum doors and bald eagle transom grills; marble steps, floor tiles and wall panels; brass borders and bronze postal boxes. The Alaska Public Lands Information Center now occupies the basement, providing information year-round on state and federal lands and parks in Alaska. 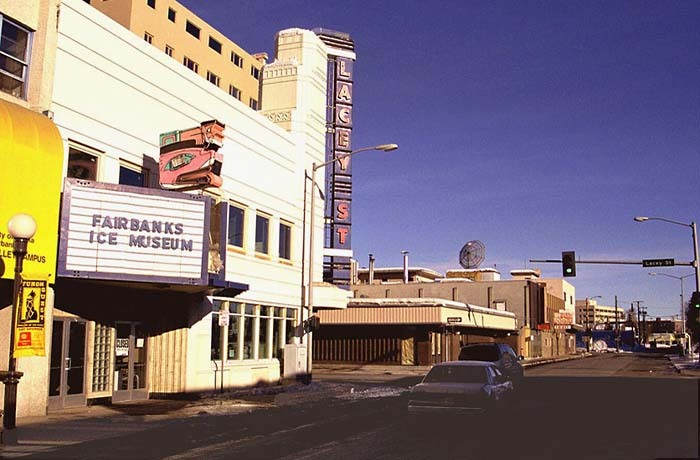 Second Avenue with the historic Lacy Street Theater, build in 1936, now the home of the Fairbanks Ice Museum, billed as 'The Coolest Show in Town', with ice sculptures and a presentation of the 'Ice Sculpting Competition' held each March in Fairbanks. 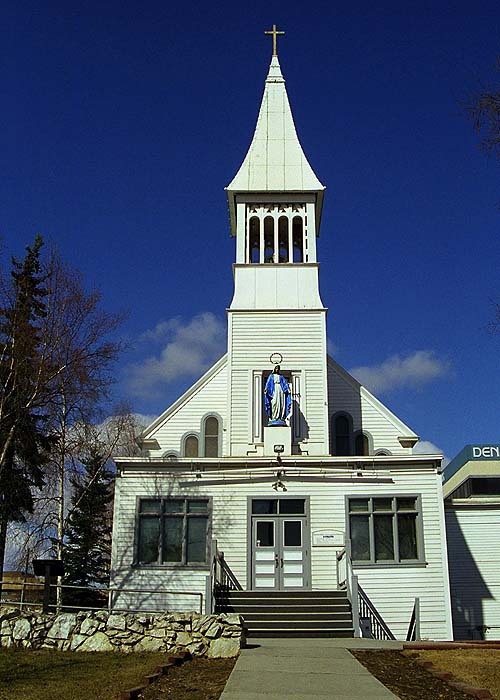 The Immacuate Conception Church on the North bank of the Chena River at Cushman Street bridge is the town's first Catholic church, built in 1904. Originally it was located on the other side of the river, on First Avenue and Dunkel Street. In the winter of 1911, the church was moved closer to old St. Joseph's Hospital, now the Denali State Bank. Horses pulled it across the frozen river, using logs to roll it.